Just before Showtime at the recent John Cooper School production of William Finn’s 25th Annual Putnam County Spelling Bee, a colorfully costumed troupe of students paraded across the stage, musically accompanied by “The Flight of the Bumblebee.” They marched around the auditorium and mingled with the audience. Their mission was to alert that audience of the available fundraiser option to purchase plaque personalization for one of the theatre’s seats. Certainly this first-class theater complex is worthy of support, and the show that followed was ample proof of that. It was back in 2004 when the Masquerade Theatre presented the Houston debut of Mr. Finn’s intriguing play, “A New Brain.” The author himself was present with us in the Opening Night audience as Masquerade presented that true story of Finn’s own successful battle with brain cancer. 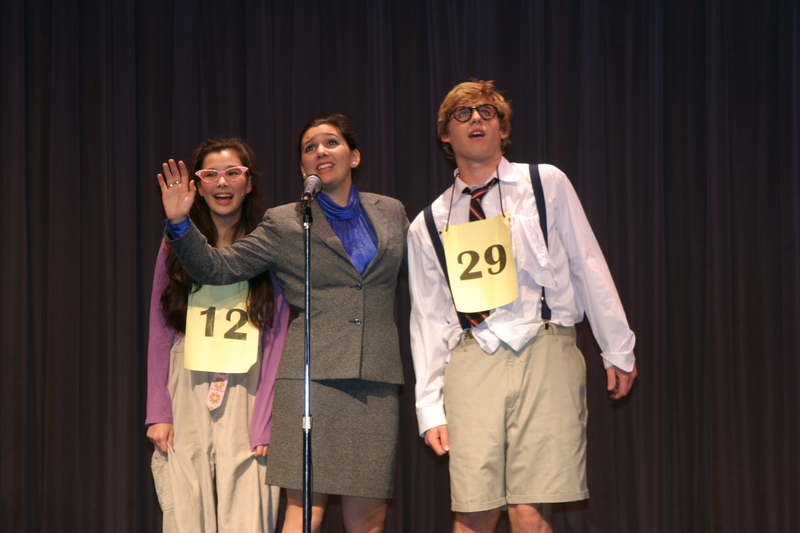 His Broadway show,“25th…Spelling Bee” is one of the many benefits of his survival, and how appropriate to have it performed here with real students in a real school, and very fine direction from Joseph DeMonico. 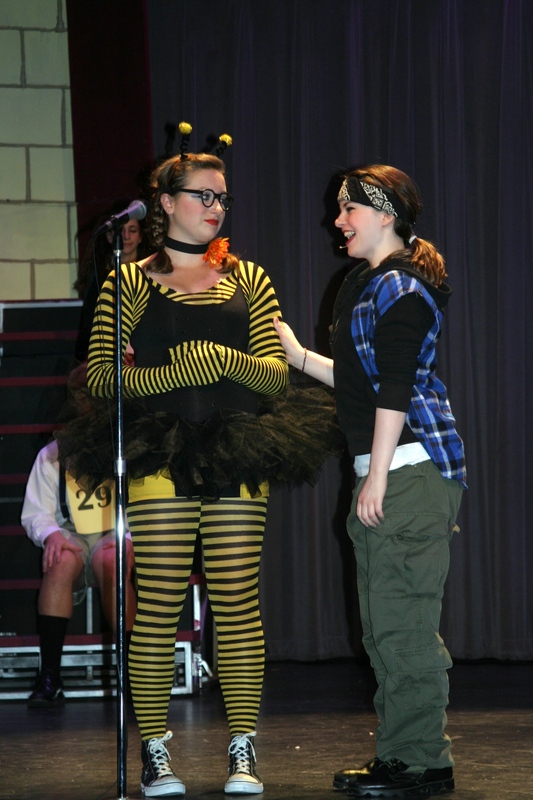 A large ensemble cast lit up the stage for the title tune opener as some neatly costumed buzzing bees added to the fun. Then it was on to the spelling contest itself with a velvet-voiced, and very articulate, Angie Lopez-Videla playing the moderator (and previous champion), Ms. Rona Peretti. She brought such maturity to the role that at first I thought she was an adult staff member as she skillfully led the singing of “The Rules,” and later did a fine rendition of “My Favorite Moment.” Emily Jacobson does nice work as the ever-vain (and sometimes tipsy) Vice Principal, Loretta Panch, back to assist with the proceedings after a five-year absence. 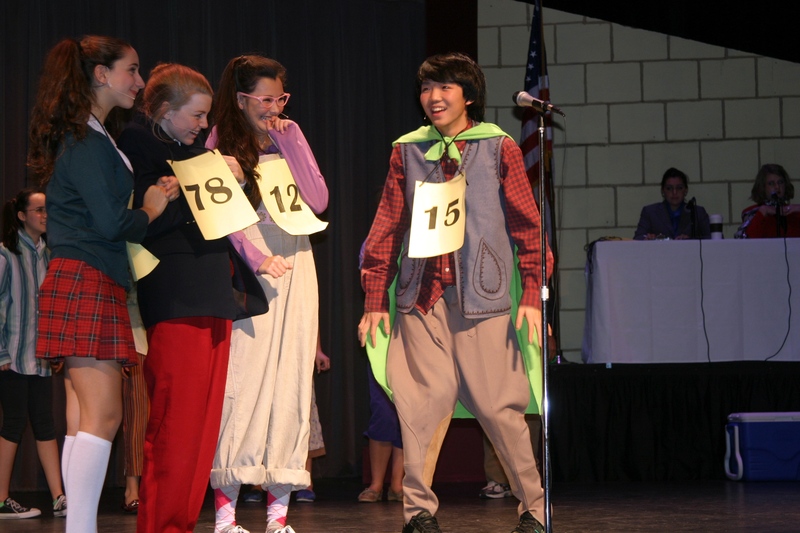 As for the many contestants, there were a wide variety of personalities. Derek Tam clearly had a gift for comedy, as he portrayed the not so confident, Leaf Coneybear. Brimming with confidence and stage presence, Tam delivered a solid, “I’m Not That Smart,” that was a real winner. With an elusive father, and with her mother in India, the sweet and neglected, Olive, is portrayed by Caitlin Finnie. With an obviously well trained voice, Miss Finnie was a vocal charmer singing about her one real friend, the “Dictionary.” Before show’s end, Olive would sing one of the production’s sweetest songs, “The I Love You Song,” joined by her mother (Kelly Zupan) and father (Alessandro Portela). The ensemble singing of “Goodbye” was an amusing touch as contest losers were escorted from the stage. Contest fairness is even called into question during the angry desperation of the song, “Pandemonium,” staged with a kind of organized chaos. In a compelling performance, Alex Novak plays the smugly confident William Barfée, a finalist from last year who has the unique style of spelling out a word with his foot before giving his answers during the bee. With an amusing cowlick atop his head, he leads the cast in the knockout number, “Magic Foot,” that features fine ensemble singing (Music Director, Donna Arnold / Band Director, Bob Scannell)), and dancing (Choreographer, Elizabeth DeMonico). The exciting back up and movement from the cast complemented Cagle’s thrilling voice and left the audience hungry for more. As for Mr. Farley, he carried on with a skillfully delivered, “Chip’s Lament,” that had him bravely singing his way through the audience without missing a beat. It was notable that for him and the other cast members who moved about so freely, there was never any failure of the tricky body microphones. Cooper’s audio video coordinator, Troy Dingle, should offer a training workshop for all the local theaters in this area where microphones are often a distraction. 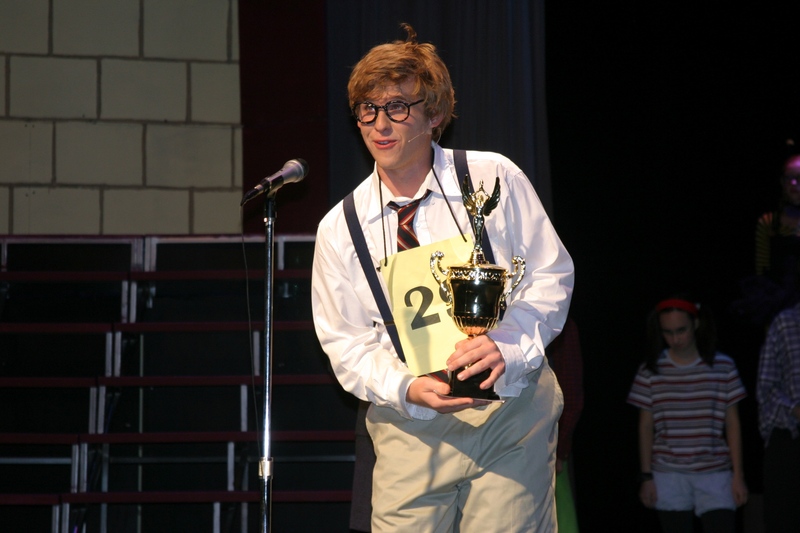 As for the ultimate Bee winner, William Barfée, Mr. Novak’s performance was a winner as well. There were so many other fine moments made possible by supporting players and production crew too numerous to mention. One can only wonder how very many people combined their talents to put on such a successful show. Bravo! The John Cooper School will participate in the ninth annual Tommy Tune Awards for Excellence in the Musical Theatre to be held at Houston’s Hobby Center on April 20th, 2011. I want to tell you how very grateful we are for your coninued support and encouragement of the high school arts here in Houston. Your reviews do so much to shine a light on the accomplishments of our courageous and hard working students. These kids take tremendous risks to create the stories that they present to the community and their peers. Over the years you have been so good to us here at Cooper in your commitment to covering our productions and, up until this time, I have been remiss in my communicating my sincere thanks and gratitude. I hope that you can forgive my not mentioning my feelings sooner. It was not for lack of respect to be sure. You deserve kudos for all you do for all performers in the arts and I wanted you to know that, for me personally, it is to be applauded.